Friday in Canmore was team relay day. Norway’s Lars Helge Birkeland, Vetle Sjåstad Christiansen, Erlend Øvereng Bjøntegaard and Johannes Thingnes Bø won the men’s 4 x 7.5-kilometer relay in 1:16:36.6 hours while acquiring no penalties on the shooting range and using seven spares. In second place was France’s Antonin Guigonnat, Emilien Jacquelin, Simon Fourcade, and Quentin Fillon Maillet. The French team finished 1:10.4 minutes back with no penalties while using eight spares. Russia took the third podium position with Evgeniy Garanichev, Eduard Latypov, Alexander Loginov, and Alexander Povarnitsyn. With no penalties and using nine spares, the Russians crossed the finish line 1:48.4 minutes back. 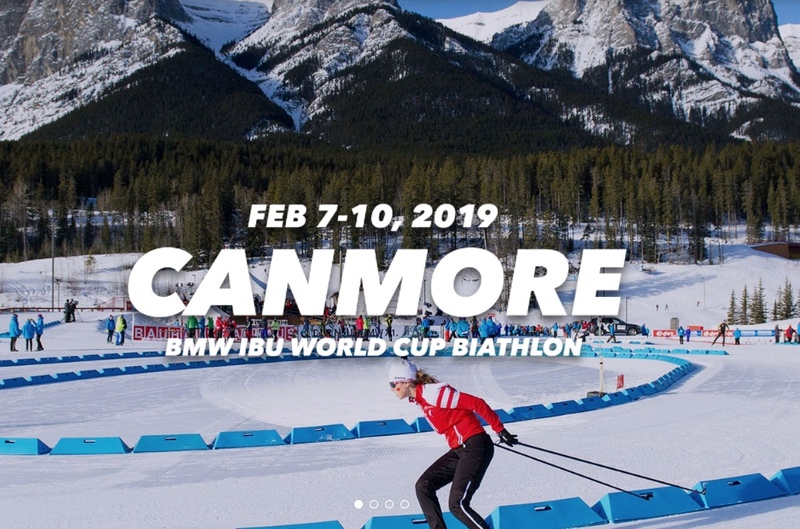 Christian Gow, Scott Gow, Jules Burnotte, and Brendan Green racing for Canada all began in bib 18 as the 18th ranked team and hopped eight positions in the final standings to finish 10th (+4:53.2). In total, Canada had two penalties while using 18 spares. It was also the final race of Green’s career. The U.S. team of Sean Doherty, Leif Nordgren, Max Durtschi, and Travis Cooper was lapped and not given an official time. Doherty skied the first leg and tagged off 41.4 seconds behind first-place France. Nordgren raced second and tagged Durtschi with a 2:49.7 minute deficit. Durtschi was lapped on his third and final ski loop after shooting 3+3 and 2+3. The women’s 4 x 6 k relay Vanessa Hinz, Franziska Hildebrand, Denise Herrmann, and Laura Dahlmeier took the win in 1:10:16.3 hours. The German foursome had a total of one penalty lap while using 12 spares. Emille Aagheim Kalkenberg, Ingrid Landmark Tandervold, Tiril Eckhoff, and Marte Olsbu Roeiseland raced to second place, 30.2 seconds back. Kalkenberg used all her spares and skied two penalty laps to put the Norwegians in an early hole. On the next three legs, Norway used four spares total to pull themselves back into contention. Anais Chevalier, Justine Braisaz, Anais Bescond, and Julia Simon racing for France placed third (+41.6, 0+12). The U.S women took eighth overall, finishing 3:58.4 minutes behind. Susan Dunklee, Clare Egan, Joanne Reid, and Emily Dreissigacker had two penalties while using 12 spares during the race. For Canada, Sarah Beaudry, Emma Lunder, Megan Bankes, and Rosanna Crawford For Canada, Sarah Beaudry, Emma Lunder, Megan Bankes, and Rosanna Crawford placed 18th. The Canadians were lapped on the final ski loop of the second leg. Tomorrow’s scheduled sprints for both the men and women have been postponed to Sunday die to predicted cold temperatures.